A Powys care home's much-loved resident dog, Ellie May, is one of the four finalists at the prestigious Crufts dog show this year in the 'Friends for Life' award category. 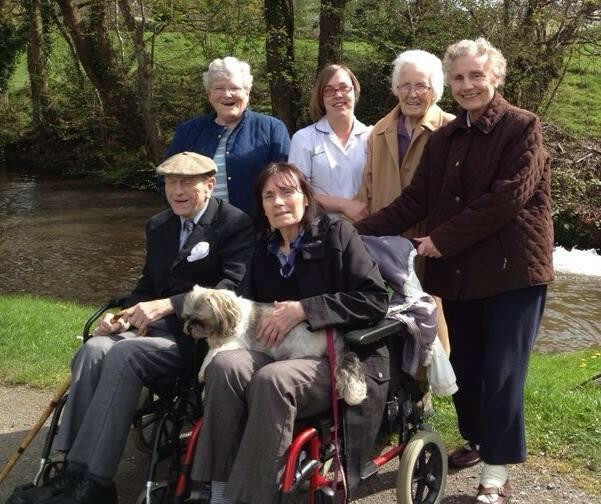 Ellie May (pictured below with care home residents), lives at Oaklands Residential Home in Llangynidr, near Crickhowell, Powys. She is a firm favourite with residents and manager Julie Cashell says, "She has made our care home a home". The nine-year-old Lhaso Apso initially lived with manager Julie until she decided she'd rather live at the home with the residents when she was a few months old. Residents of the home, which is a Care Forum Wales member, are now appealing for the public to vote for Ellie for the Eukanuba Friends For Life competition 2015 which is organised by the Kennel Club. The deadline for votes is March 7, 2015. Julie Cashell said: "What she does all day is look out for everyone. If somebody is distressed, if somebody is unhappy, if somebody is confused Ellie May has naturally herself gone looking for them to make sure that they're OK.
"A big feature of having Ellie May here is encouraging older people to come out for a walk with us, encouraging people to keep mobile and as part of the community," she added.